YAAA! My Ghost Peppers are Finally Growing. 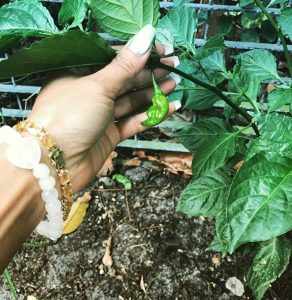 While out in the garden I noticed my lil’ Ghost Pepper plant a had actually sprouted a pepper. Up until now I only saw a bunch of tiny blossoms but none have ever materialized into a single pepper. Now, I can tell you .. I’m use to handling peppers all the time. 90% of the time I’ll cook with Thai Peppers but if none are readily available I’ll add in some Jalapeños. Of course at a mere 5000 Scovilles, they’re not nearly as hot as my go to Thai Pepper, which rate at 100,000. However .. After reading how hot these Ghosties can be (up to a 1,000,000 Scoville units), I may have to re-think my bare handling chopping technic and use some gloves. Previous Post:Bad Weather / Hair Day!